Reading the title of this article would cause even moderately observant Jews to scoff. For anyone living in (or seeking to relocate to) the more observant precincts of our tribe, the value of Talmud is axiomatic. But for many of us, particularly those raised in the traditions that emerged out of Haskalah, the Talmud is a mystery, largely because one of the core tenets of the Jewish Enlightenment was the effort to remove Talmud study from Jewish education, beginning with the Free School in Berlin in 1778. Today, millions of Jews have grown up with only a vague understanding of what Talmud is, and have no idea of its continuing relevance to Judaism. For these Jews – and I am one of them – we cannot take as axiomatic the value of Talmud. We must, instead, begin to articulate it so that its study returns to its rightful place in the education of every Jewish child. I see Talmud as a kind of “Congressional Record” of Judaism, a scholarly proceedings that not only list the conclusions that were reached on a topic, but the exigetical process to reach those conclusions, and the debates over different interpretations. In so doing, Talmud reminds us that in Judaism, the ultimate decision has importance, but that this does not take away from the innate value of the losing argument and the debate itself. In so doing, the redactors of the Talmud were handing us an invaluable gift, the blueprint to keeping Judaism relevant even as we remain rooted in tradition. No other work in the vast library of our faith can weave such a powerful, uniting fabric. I was raised a Reform Jew, and my formal Jewish education, which I continued until I was 18, never delved into what Talmud was. It took the beginning of my Teshuvah at age 31 and Adin Steinsaltz’s superb The Essential Talmud to begin addressing my ignorance. There is no reason that this should happen to another generation. Talmud helps us cleave to Torah because it is a major part of what makes Torah a living thing, not just an ancient scroll. If we cut Talmud away, we remove the most important handhold for ourselves and our children to Jewish tradition. Let’s bring Talmud back to liberal Judaism, and let us recognize that this is not part of an effort to turn the Reform movement into some kind of unbearded Orthodoxy, but to emplace in our heritage one more post in the fence that keeps us from apostasy or assimilation. It is sad to me when apparently otherwise intelligent people cannot get it through their heads that Israel is in a war for its existence. The fact that Israel’s enemies are using different, asymmetric means to try to achieve that goal does not change the end game: it merely alters the weapons and tactics. Anti-Semitism never died in America. We all scoffed at Irv Rubin and lightened our donations to the ADL, but G-d bless them, they never went off-watch, even when we did. It is time we all wake up and realize that what we are seeing on the streets of Europe’s capitals has now come to America in a way that is much bigger and much more mainstream than what we faced with neo-Nazis and the KKK in the 1970s. This will be politically uncomfortable for many of us, but we have to see that the interests of our people and our faith must rise above the dividing lines of American politics. For if it does not, we will be divided, conquered, and sent again to wander when our home no longer welcomes us. Whatever his other faults (we disagree constantly on China), Tom Friedman knows the Mideast and its conflicts from many sides, and has won two Pulitzer Prizes bringing clarity to those conflicts to those of us here in the US. It is in no small part because of this reporting that America’s friendship with Israel is no longer unconditional. For these reasons, this story is of particular interest. It is the first of what I expect will be a growing number of reports from respected journalists who have found gaping holes in the Hamas narrative. Friedman offers both context and content. He lays out, simply and clearly, the Hamas strategy to isolate and then destroy Israel. That it is not working is less credit to the Obama administration or western media than to a willingness by Israel to risk international censure to ensure its survival. The first thing I thought when I read this article by Amanda Marcotte was that either she – or Slate – are on the payroll of the American Restaurant Association. Let us abandon that line, and simply stipulate that Slate.com is in the business of purveying linkbait, and that is all this is. There is nothing easy or quick about a home-cooked dinner. It can be a huge pain, especially if you are cooking for less than three or more than four. But if we are going to assess the costs, we also must weigh the benefits. Home cooked dinners are generally not only more nutritious than comparably-priced restaurant food, they also serve to deepen the connection among family members, as they often represent the only time of the day when everyone is together and not getting ready to rush off elsewhere. Getting kids and adults together is miserably difficult, and in the case of teenagers, a decent feed is often the only way to yank them out of their electronically isolated mind-caverns. The family meal is also a time when you train your kids how to act like ladies and gentlemen, how to hold a civilized conversation, how to treat others (including the siblings they hate with a passion) with a modicum of decency and respect, and a hundred other behaviors and traits that will form them in life. Are those things not priceless? Are they not at the very heart of what it means to be a parent. 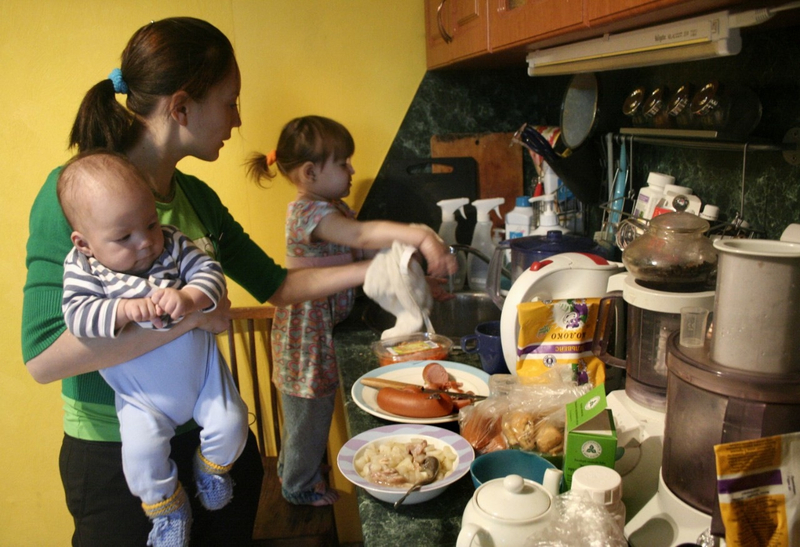 Yes, there are things we could do to make it easier for low-income and two-working-parent families to cook at home. But let’s talk about those things, and not about abandoning the home-cooked dinner to the Merchants of Fat simply because it is easier. No, cooking is not convenient. Nor is pregnancy, changing a diaper, doctor’s visits, braces, driving a carpool, giving up your evenings and weekends to school nights, homework, sports, scouts, or any of dozens of activities that you only take on as a parent. But as much as taking the kids to soccer or being a little league coach, the family dinner is an indispensible part of being a parent. If you don’t want to cook because it is messy, inconvenient, and nobody is grateful, the problem is not the family meal. The problem lies elsewhere.